The quality of your family’s comfort depends on your home’s indoor air quality. That’s why we recommend a complete range of York® indoor air quality equipment that can ventilate, humidify, dehumidify, filter and provide ultraviolet air treatment to ensure a healthy home environment. Today, homes are sealed more tightly to conserve energy. Unfortunately, this seals in mold, pollen, bacteria and other pollutants. And since the U.S. EPA ranks indoor air pollution among the top five environmental risks to public health, many homeowners are concerned. Fortunately, there’s a solution to most indoor air quality problems. 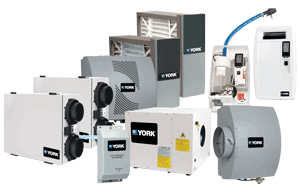 York® offers an array of choices designed to ventilate stale indoor air, zap airborne germs, trap airborne particles and moisturize parched air. A study conducted by the U.S. Environmental Protection Agency found that indoor air could actually be more polluted than outdoor air. Considering that most individuals spend up to 90 percent of each day indoors–more than half of that time at home–you may be experiencing indoor air pollution without even knowing it.